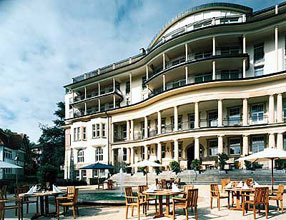 The sophisticated Kempinski Hotel Falkenstein has been established in 1909 by Kaiser Wilhelm II as a lodging house for German army officers. The hotel complex, situated in the middle of a large park, consists of 6 buildings styled to resemble English manors, and one principal neoclassical mansion. With its excellent location, exceptional cuisine and a great health spa, the hotel is a top choice for both business and holiday travelers. It offers 59 air-conditioned guestrooms and 30 apartments equipped with kitchenettes for long staying guests. The rooms are elegantly designed and furnished with fine fabrics that create a unique ambience of timeless elegance and well-being. All of them are equipped with cable TV, ISDN and data-port connections, mini-bar, safe, hairdryer, and some are equipped with balconies, from where it's possible to admire Frankfurt's impressive skyline. Guests will have the opportunity to taste fine specialties in the Siesmayer Restaurant, where an original blend of the regional, classical, and Mediterranean cuisine will satisfy even the most discerning gourmets. The cozy bar featuring a lounge with a fireplace is ideal for drinks and will set a relaxed end to the day. The exclusive wellness area of the hotel features an all year round heated outdoor pool (29 C), gym, sauna, whirlpool, and Jacuzzi. In the surrounding area guests will find a wide range of activities and facilities for their recreation. These include golf courses, bicycle tours, and interesting landmarks to visit. The Kempinski Hotel Falkenstein offers five exclusive meeting rooms, completely renovated and with an extraordinary ambience that will set the perfect environment for your business meeting, banquet, or celebration. Other conveniences of the hotel include 24 hour rooms service and free parking area. Surrounded by six hectares of wonderful parkland, the Kempinski Hotel Falkenstein is located 20 km away from the city centre of Frankfurt and 35 km away from Frankfurt Airport.